Design objects which are regularly used w.r.to design are design is explained below. 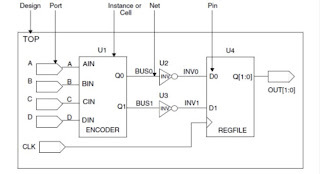 Design corresponds to the circuit description that performs desired logical function. A design consists of instances, nets, ports, and pins. It can contain subdesigns and library cells. This is the original design to which the cell or instance refers. A reference is a library component or design that can be used as an element in building a larger circuit. 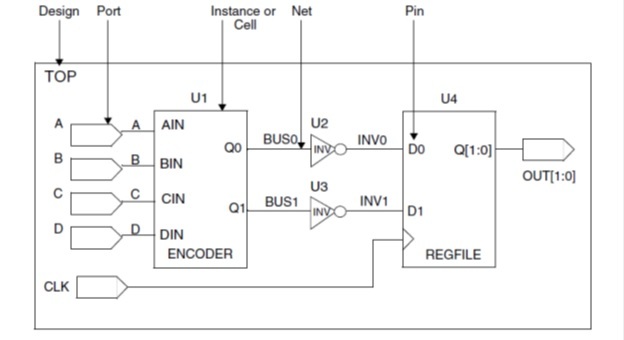 The structure of the reference can be a simple logic gate or a more complex design (a RAM core or CPU). A design can contain multiple occurrences of a reference; each occurrence is an instance. An instance is an occurrence in a circuit of a reference (a library component or design) loaded in memory; each instance has a unique name. A design can contain multiple instances; each instance points to the same reference but has a unique name to distinguish it from other instances. An instance is also known as a cell. A unique instance of a design within another design is called a hierarchical instance. A unique instance of a library cell within a design is called a leaf cell. Ports are the inputs and outputs of a design. The port direction is designated as input, output, or inout. Pins are the input and output of cells (such as gates and flip-flops) within a design. The ports of a subdesign are pins within the parent design. Nets are the wires that connect ports to pins and pins to each other.